October 4, 2018 The votes are in, and Shadow Warrior 2 is now free on GOG. It’s been a decade since since CD Projekt launched GOG, its DRM-free storefront. The store is celebrating the occasion as any retailer might – with giveaways and big sales. 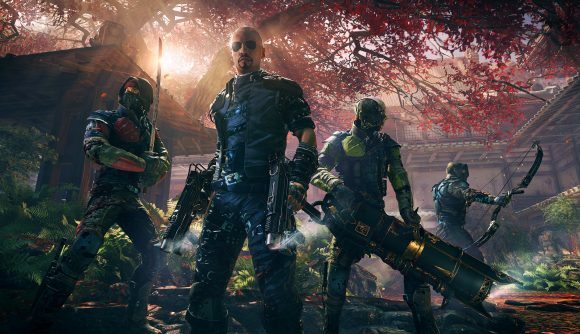 Votes for the promotion’s free game have been tallied, and you can now get a free copy of Shadow Warrior 2. The reboot sequel competed with the terrific likes of Superhot and Firewatch, but GOG users decided they wanted videogame killing in its most traditional form – and really, who can blame them? You can claim Shadow Warrior 2 for the next 48 hours, and it’ll remain DRM-free in your GOG library forever. You can pick it up on GOG.com, and check out the anniversary sale while you’re at it. It includes current greats like Frostpunk, Battletech, and Divinity: Original Sin 2, and plenty of good old games including Doom II, Morrowind, and the classic Fallouts. But you can find the best deals among a set of three 10th anniversary collections. The Timeless Essentials package combines Theme Hospital, Dungeon Keeper 2, Another World, and System Shock 2 for $5. The Art of Aging Gracefully brings together Dragon Age: Origins, Owlboy, and the Homeworld: Remastered Collection for $10. The Modern Classics collection gets you Kingdom Come: Deliverance, Battle Chasers: Nightwar, and Shadow Tactics: Blades of the Shogun for $25. GOG’s also taking the opportunity to make some big debuts alongside the event. The excellent space 4X Stellaris has gone DRM-free on the store, and Indiana Jones and the Infernal Machine has emerged from the LucasArts archives. If you’re a regular GOG user, you’ll also note some visual changes to the store, and some upcoming changes to the review system and how games are presented aimed at making it easier to discover titles of interest.